The task of writing 100-something personalized wedding thank you notes may seem tedious, but it’s definitely doable. And the faster you get them written out and sent, the happier you’ll be (we promise). Forget the “one year to send a thank you note” myth. At PAPER & LACE, we suggest you thank your wedding guests within three months or so. 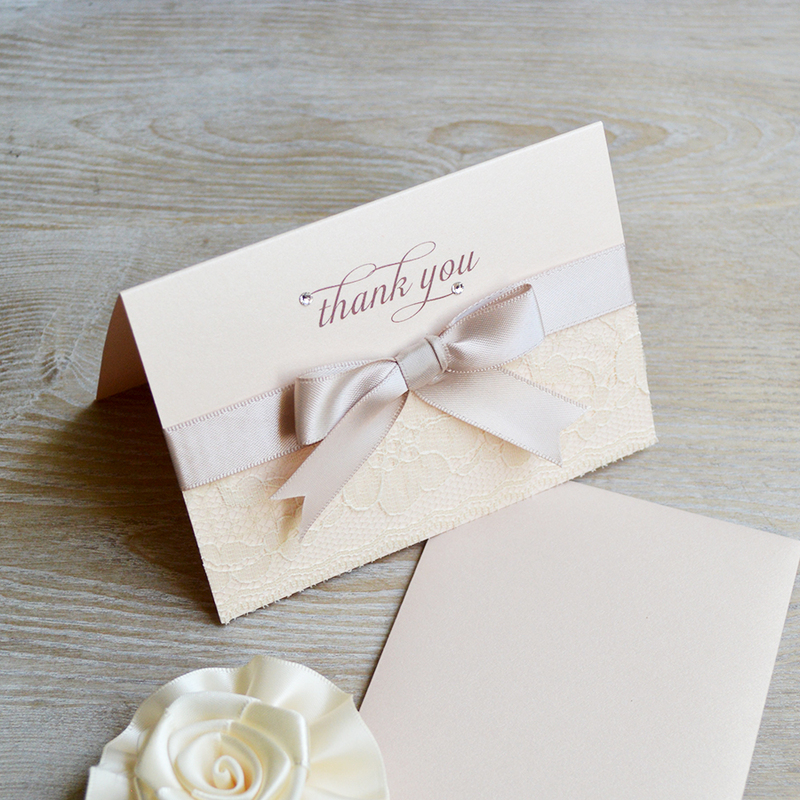 Oh, and just to push your buttons a little more, thank you notes for all gifts received before your wedding day should be sent within two weeks of their arrival (gifts received past the date of your big day should follow the same, three month rule). We know you. You are a timeless, thoughtful, and classy bride! 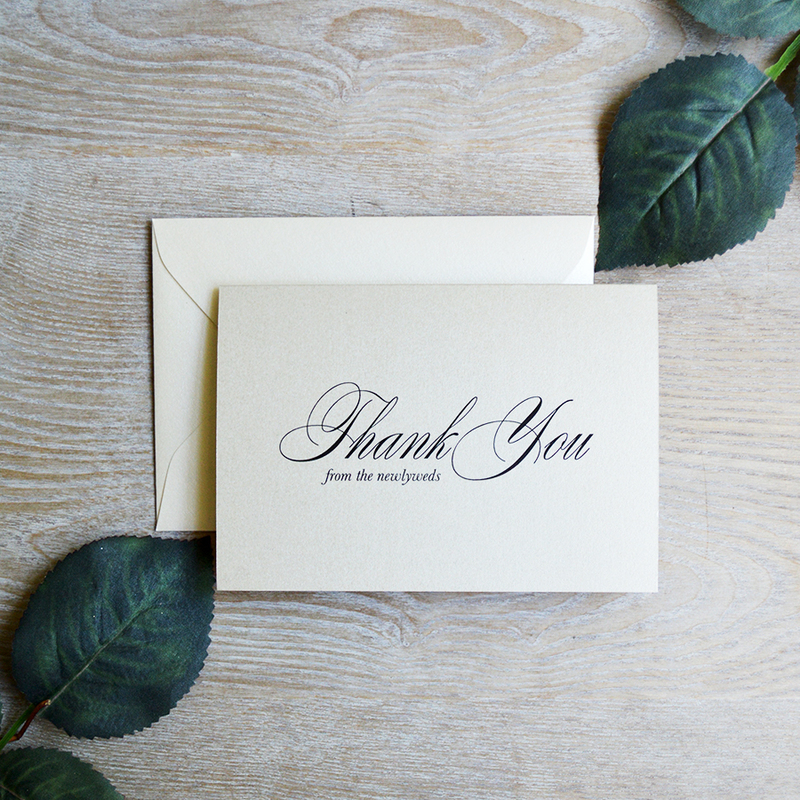 After your amazing wedding day, a personalized thank you note will remind your guests just how kind and considerate you are. At the very least, a wedding thank you acknowledges the time and thought your guests put into attending and celebrating your nuptials. 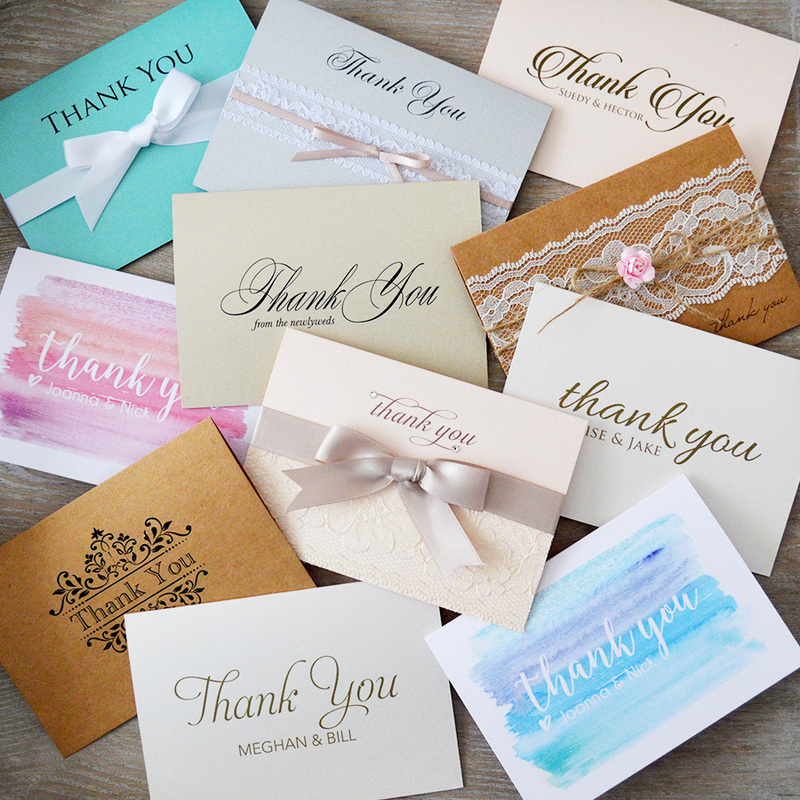 At the very most, wedding thank-you notes can remind a friend or family member how much they mean to you. You have the chance to thank them, not only for adding to your big day, but for being part of your life. So sweet! Avoid some of the wedding thank-you headache by planning your thank-yous out way before you open your first gift. 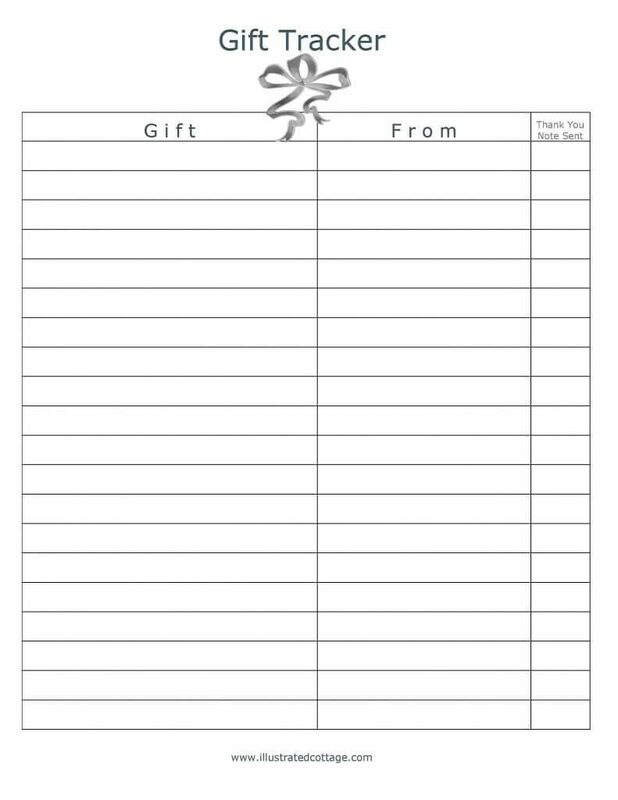 Make a copy of your guest list, adding columns for gifts and thank you notes. This will help you keep track of the gifts you’ve received (and from whom) as they come in. Check off the thank you note column as you begin writing and sending the notes. It’s easy to think you’ve already sent a thank-you to your Aunt Leslie when you’re penning so many. Don’t check off Aunt Leslie’s name until you’re sure her thank you is in the mail. Thank you notes never go out of style, so, again, start planning early and stock up on thank you notes shortly after you get engaged. 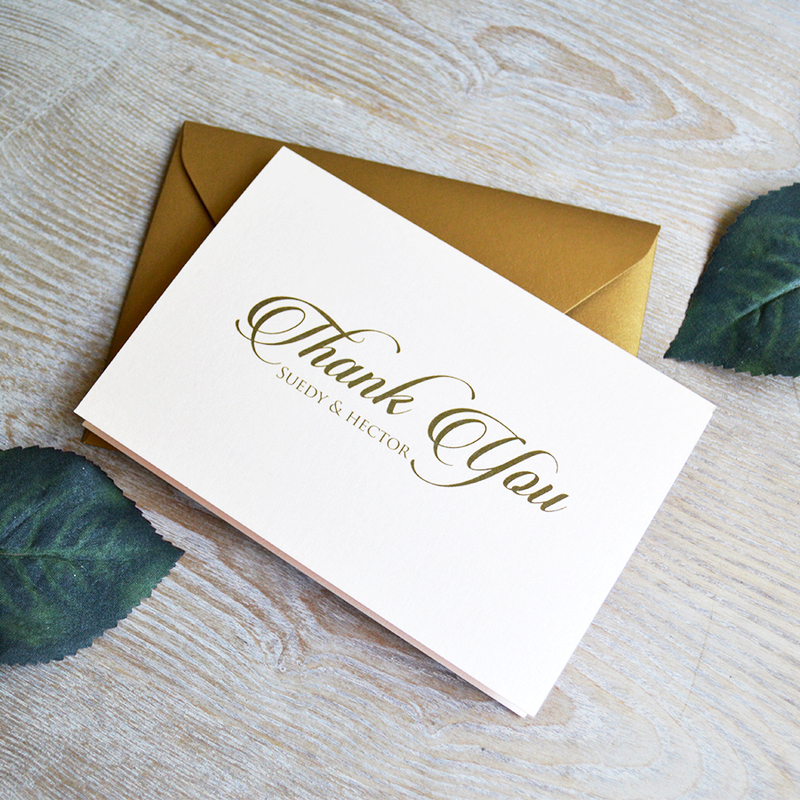 A custom-designed thank you note with a sweet message goes a long way and can be sent out as gifts start coming in. A quality-ink pen will do wonders for hand-written sentiments. Stick with blue or black ink and make sure it won’t smear or bleed through your note cards. You should also stock up on a roll or two of Forever stamps, so you’re not hunting down postage every time you seal an envelope shut. Sit down, relax, pour a glass of vino, turn on your favorite playlist, and get writing… but don’t attempt to get all of your wedding thank you notes done in one sitting! Instead, set aside 30 minutes every night to tackle your thank-you list. Of course, keep in mind that the wedding gifts you’ve received were intended for BOTH you and your fiancé. Regardless of who’s penning the thank-you, sign both of your names. To establish equality, divvy up the list and share the responsibility. More or less, do whatever works best for you two as a couple. Personalize your thank-yous to reflect your relationship with the guest(s) and the gift they gave. Use specifics whenever possible. 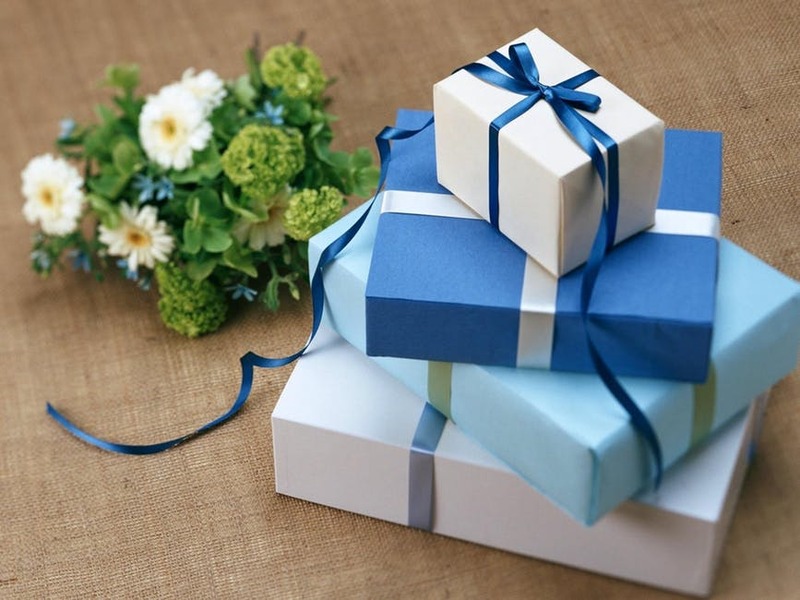 Even if you’ve been given a monetary gift, explain how you plan to use it, like “we’re saving for our first house” or “we can’t wait to indulge at the spa on our honeymoon.” And remember, your guests’ presence was a present too—don’t forget to thank your gift giver for attending your wedding and for thinking of you at this special time. If the wedding gift comes from your registry, it’s something that you most likely wanted, so mention how much you love it and plan to use it all the time. Stick to the specifics once again. Refer to your columned guest list to find the specific name of the gift, and then mention it in the note along with how/when your plan to use it. When it comes to money, avoid mentioning the amount of money given (a word like generous will do the trick), but, as mentioned, remember to share how you plan on using it. Be a generous bride here – send each member of the group their own thank you note, aside from families (including children) who live together. Don’t mention to shout out the group as a whole here, too. This may seem obvious, but opt not to mention that you already own the gift (or that you’ve returned it). Instead, focus this thank-you note on the gift-giver and their thoughtfulness. If you’ve received a gift from someone neither you nor your fiancé know personally, it’s totally acceptable to note that you’re strangers, but mention too that you look forward to meeting in the future. Give yourself bonus points if you can connect the unknown gift-giver to a relative or friend. Focus again on the givers rather than the mysterious gift. Thank your guests for the “wonderful gift” and their presence at your wedding… and leave it at that. Acknowledge the generous gift and how you wish the specific guest could have been at the wedding. As previously mentioned, your guests’ presence is a present, and that’s worth a thank you even if their presence doesn’t come with a physical wedding gift. Acknowledge their participation in your special day, especially when they’ve traveled or made a special effort to be there for you. Tired of saying thank you? Wow! The [wine goblets] you sent are just gorgeous! The [cookbook set] is perfect! Do you know us or what? At PAPER & LACE, we offer a wide variety of custom wedding thank you cards to match your wedding’s style, personality, and feel. Browse our collections or get in touch with us today to create something that your wedding guests will truly cherish!